Heise Teaches & Writes (& Reads on another blog): What is "real" Reading? In helping my students think about increasing their reading stamina now that they're in middle school, I often look for ways to make it clear what reading behavior looks like in the classroom. I want to help them avoid the "fake" reading that often happens before they're fully into their books and to understand that I do realize it happens, but give them ways to try to become more focused so that they aren't distracting others and are able to make use of their reading time in class. I came across some anchor charts on Pinterest showing Real Reading vs. Fake Reading. I liked the idea of the chart delineating what each looks like, but as I started to make my chart I realized that I really disliked the idea of there being such a thing as "real" reading. Something about that terminology just didn't sit well with me. I want my students to be motivated to read the books they choose based on their interest, and what I really want to see when I look around the room during reading time is a roomful of engaged students. Ones who are engaged in their books, instead of distracted by or distracting others around them. So as I compiled my list for the anchor chart to present to my students, I made a slight adjustment to the idea I saw. 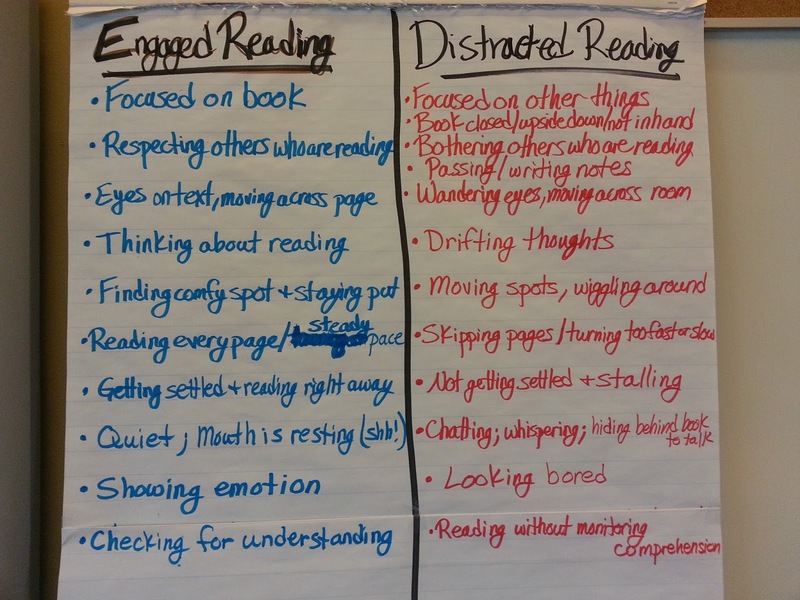 I talked with my students about Engaged Reading vs. Distracted Reading. I introduced the chart saying that the distracted behaviors are ones I've seen in observations the first few weeks, but that they're also things I've occasionally done myself if a book isn't jiving with me or something major happens that distracts me that I can't stop thinking about. By acknowledging that it happens to all of us, and is something that even I (a "real" reader in their eyes) struggle with at times, I think it helps them be less worried about admitting they do it, too. They don't have to worry that if they sometimes do these things, they can't be "real" readers. But by presenting the engaged behaviors, it also gives them something tangible to try to do to move from distracted to engaged reading behaviors. And whether engaged or distracted at a given moment, all of my students are real readers. I love this. Going to talk about this today with my sixth graders.